The wait is finally over! 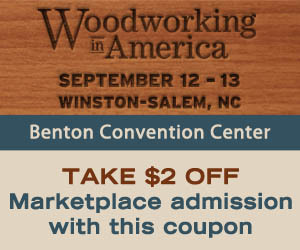 As this post is going live I’m close to boarding a plane heading to Woodworking in America 2014 in Winston-Salem, North Carolina. If you’re in attendance be sure to keep an ear out for the Chortle or an eye open for the Woobie and then come up and say “hi,” I always look forward to meeting as many woodworking friends as possible each visit. For whatever reason, if you can’t make it this year I promise to gather up as many photos, videos and great stories from the weekend as possible to share with you in the days to follow when I get home. Don’t forget, the whole reason I’m able to attend this year, to keep getting this great content, is thanks to the folks at Highland Woodworking . I’ll not only be gathering great content for my own blog, but for their’s also. Can’t make it for the entire weekend but have a few hours to spend in the vendors marketplace? You’ll find me in there too…a lot! Print this coupon and save a couple of dollars on the entry fee, then use it on an amazing tool, or spend all your time checking out the free seminars happening every hour. I wish I could have made it this year. Looked like it was a lot of fun with all the internet crowd and meet ups.